The Hon Michael Kirby AC CMG provided closing remarks for the Asia Pro Bono Forum together with Indonesian lawyer Todung Mulya Lubis (see separate story). Commenting that he usually takes only one or two good ideas away from a conference, he then proceeded to list twenty good ideas that he had picked up at this Forum. The secret that lies behind the growth of pro bono is that many lawyers desire to perform at least some pro bono work, especially if it helps to secure justice for the litigant and the community. That pro bono lawyers must sometimes embrace unpopular causes. They may face personal risks in taking up matters that sometimes enliven hostility and even risk. That pro bono lawyers, however brilliant and attentive, cannot necessarily guarantee success but this does not release the lawyer from the obligation to try. Pro bono activity is an essential duty of lawyers. The principle of not discriminating against any population of a nation is an essential principle for pro bono lawyers. Countries should ensure a sufficiency of lawyers. It is essential that those who seek to advance pro bono lawyering should address themselves to legal education and to the availability of well-trained lawyers who can perform public interest litigation with skill and professionalism. Pro bono lawyers should work closely with civil society organisations so as to best identify and tackle the basic causes of injustice. To motivate lawyers to do pro bono in firms, there is a need for motivation and idealism. The actualities of oppression, misuse of power and injustice will be the stuff of inspiration and attraction. Making sure that pro bono work takes on unpopular causes and sometimes distasteful clients will be the test for the extent that pro bono lawyering is succeeding in its objectives. Supporters of pro bono lawyering need to work with professional bodies to find new guidelines and, where appropriate, open up the availability of advice and break down the closed shops that exist in most Asian countries that prevent lawyers from other countries practising. There is a vital role that professional bodies can play in advancing and affording pro bono assistance. While Governments and professional bodies have the obligation to promote the symbolism and actuality of the commitment of lawyers everywhere (including in-house counsel) to helping the attainment of justice and the rule of law, pro bono culture can be advanced considerably simply by the work of a small group of dedicated lawyers. Immunising the pro bono practice from the dangers of conflict can be achieved, and to the extent that this concern can be overcome, it will assist the spread of pro bono lawyering. Retired judges can sometimes be engaged to support and encourage young lawyers, keen to grapple with significant cases of pro bono. There is a difference to be drawn between acting boldy in a pro bono matter and the bravery required where there is a risk to life or limb of the lawyer. It demands assessment of the risks in each individual case and in each country. Leadership, example and demonstration of the truth are the values that are likely to make particular causes ‘cool’ and thus attract pro bono lawyering. e.g. cases in defence of LGBTI rights. The true test comes when pro bono lawyers open new vistas of attitude and values. Courage and solidarity is essential to support lawyers taking on unpopular causes in other countries. Professional engagement and expressions of support for courageous colleagues in other countries is a moral obligation. Pro bono lawyering must seek out and engage with technical lawyers. Even if sometimes they seem boring and less exciting than friends from civil society. Unity is strength amongst lawyers and the Indonesian legal associations. It is important to uphold the requirement of minimum hours pro bono work as essential to the expansion of this activity in Indonesia. There is value and importance in appointing managers for the pro bono side to a practice. It is important that pro bono lawyers become actively involved in the civil society organisations that are advancing public interest causes. Not all pro bono lawyering is performed in courts and tribunals. Often, the most cost effective engagement of lawyers is with civil society leaders. Sometimes, the best legal skill will help advocates to avoid the highest courts and to discover solutions of a non-litigious character. Being an accomplished lawyer requires ‘giving back’ for the many privileges that lawyers enjoy in society. This is an attitude to be fostered. 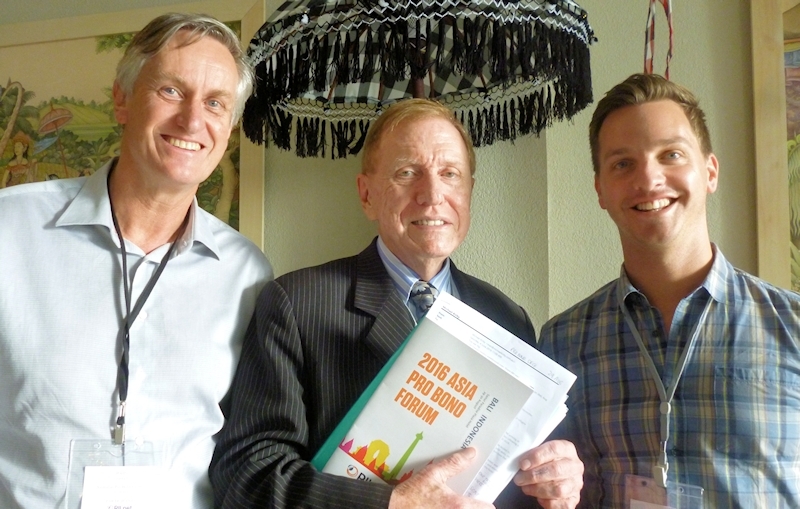 The full speech, Twenty Big Ideas, Boring, Bold and Brave by the Hon Michael Kirby, AC CMG is available here.